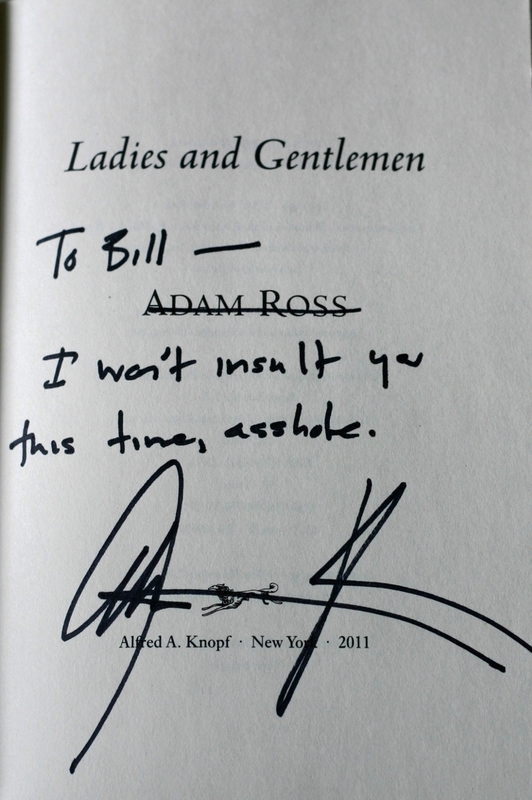 Adam Ross has a bit of Mel Brooks in him (but which part? Ba-dum-pssh!). Shining eyes that look small, set underneath a gentle curling dollop of sandy blonde hair. His almost cocky smile says he’s thinking of a joke I’d probably not get, and he’s probably right. Read his books, however, and you start to imagine a David Lynch or John Carpenter. Maybe that makes sense, describing an author by way of pop culture filmmakers: humor and psychological horror, with a dash of humanity. The author of Mr. Peanut and now Ladies & Gentlemen is no stranger to dark humor. Peanut is confounding and at times brilliant, a grim (or any of the other “dismal” synonyms various reviewers have used, like “bleak,” “dark,” or “ominous“) and often fucked-up-funny portrayal of love, marriage, and ownership set within a detective novel’s framework set within another detective novel’s framework. Or something like that. I finished Peanut thinking I’d “figured it out,” but further examination and discussion revealed that the story’s plot twists and multiple characters and even the way Ross played with the very tropes and language of murder mystery novels were often beyond my understanding. “Frustrating, but I’m probably not quick enough… very worthwhile!” would be my blurb. Plus, Adam wrote a hell of a book and was one of my first insults, back in the day, so I’m looking forward to dissecting a more manageable frog in short story form.